(2)Hardinge Conquest 42 CNC Turning Centers w/ Fanuc 0-T Controls, 10-Station Turret, Tailstock, 8” 3-Jaw Power Chuck, 16C Collet Nose. Bridgeport Vertical Mills/n 165816 w/ 1.5Hp, Trava-Dials, Power Feed. Nichols Miller Horizontal Mill s/n 8-W-6591. (2)Hardinge DV-59/DSM-59 Lathes w/ 230-3000 RPM, 6-Station Turret, Cross Slide. 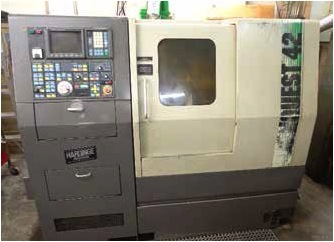 Hardinge HC Hand Chucker s/n HC-8545T w/ 125-3000 RPM, 8-Station Turret, Power Feeds. Brown & Sharpe mdl. 542-00 Ultramatic R/S Automatic Screw Machine s/n 542-00-9814 w/ Bar Feed. Brown & Sharpe mdl. 542-00 Automatic Screw Machine w/ Bar Feed. (3)Brown & Sharpe mdl. 542-0G Automatic Screw Machines w/ Bar Feeds. Star mdl. BG-2 Precision Tool Grinder s/n 900681. Falcon Chevalier FSG-612 6” x 12” Surface Grinder s/n 01-02802. (2)Dayton 6” Bench Grinders and Kalamazoo 1” Belt Sander. Ingersoll Rand and All American 5Hp Horizontal Air Compressors. DiAcro No.2 Manual Bender s/n DB-6914. Kurt 6” Angle-Lock Vise, 3” Speed Vise, (2)3” Pneumatic Vises, 5C Pneumatic Collet Closer, Fenn 5C Indexer, (85)16C Collets, (200)5C Collets, (50)No.11 Collets, (25)No.11C Collets, (40)No.10 Collets, Procunier mdl. 2 Tapping Head, (5)Huot Drill Cabinets. (2)A-Frame Material Racks w/ Aluminum, Stainless, Brass, Copper, Delrin, Phenolic Round and Hex Stock.